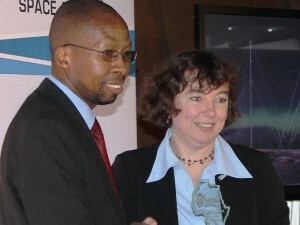 SANSA CEO Dr Malinga and SANSA MD Dr Lee-Anne McKinnell during the Radar unveiling ceremony. The South African National Space Agency (SANSA) is marking its territory as a major global player, launching Africa's first nanosatellite, unveiling a state-of-the-art In-Orbit Testing (IOT) facility, introducing a new ultramodern high-frequency digital laser, and assisting in India's first Mars operation, all within a one-month period. SA's first CubeSat satellite will be launched from Russia this week, 21 November. The satellite, called ZACUBE-1, is a type of nanosatellite measuring 10cm^3 and will be used to collect data on space weather. While this is the third satellite to be launched by SA, it is the very first nanosatellite to be launched on the African continent. The satellite was built by CubeSat students at the French South African Institute of Technology (F'SATI), which is based on the campus of the Cape Peninsula University of Technology (CPUT), in collaboration with SANSA and the Department of Science and Technology (DST). SANSA spokesperson Vaneshree Maharaj says the nanosatellite will house science experiments, one of which will assist SANSA in collaborating with the space weather radar in Antarctica. "It is a demonstrator of new technology, as well as enabling our young scientists and engineers to gain practical experience in designing and developing these satellites," she says. According to director of F'SATI professor Robert van Zyl, the CubeSat will be launched from Yasny Launch Base, in Russia, and be placed in orbit at an altitude of 600km. Running on the same amount of power as a five-Watt bulb, ZACUBE-1 will orbit the Earth up to 15 times a day, with the main aim of gathering data on space weather for SANSA. Van Zyl explains that the CubeSat programme uses CubeSat technology platforms for practical, hands-on skills training and applied research. "This approach offers our students a unique learning experience and prepares them very well to participate in the South African space industry," he says. Over a period of just three years, the ZACUBE-1 programme has graduated 22 Master's students and contributed to 10 conference papers, three scientific journal papers, the development of the African Space Innovation Centre and a Research Chair. The team at CPUT is already developing ZACUBE-2, which will be three times larger than the first, says Van Zyl. Last month, SANSA unveiled a high-frequency digital radar in Hermanus that forms part of the Super Dual Auroral Radar Network (SuperDARN), an international network of more than 30 radars used to monitor the dynamics of space weather. The radar system is expected to be shipped to Antarctica before the end of the year, where it will be installed at the South African Antarctic Research Base, SANAE IV. Antarctica is a prime location for space weather research, as the Earth's magnetic field lines converge at the poles, acting as a funnel for space plasma to travel into the Earth's atmosphere. SANSA Space Science communications officer Catherine Webster explains that, just as there is weather on Earth, there is weather in space, and it can interfere with, and cause damage to, satellites that are relied on for communication, navigation, resource management, and national safety and security. "Understanding space weather, a term used to describe the effects the sun has on Earth and the planets of our solar system, is a global priority," says Webster. As host to the only Space Weather Centre in Africa, SANSA provides an important service to the nation by monitoring the sun and its activity to provide information, early warnings and forecasts on space weather conditions. SANSA Space Science MD Dr Lee-Anne McKinnell explains that communication and navigation technology, town planning, and resource and disaster management are highly dependent on satellites operating in the space environment. "Understanding this environment has become vital in order to protect technology in space and on Earth from the devastating effects of space weather." SANSA decided to undertake the "ambitious" project of constructing the radar in-house to take advantage of the training opportunities offered by a project of this magnitude, as well as the opportunity to develop a radio frequency laboratory, says McKinnell. "Through the development of the SuperDARN Radar, SANSA is able to provide a state-of-the-art radar platform for space science research to take place nationally and internationally, further enhancing South Africa as a global space player." Another boost to SA's ability to use satellite data to address national issues, was SANSA's recent unveiling of its new IOT antennae facility at its Hartebeesthoek station. MD of SANSA space operations Raoul Hodges says the new facility consists of a new 10m Ku-DBS band antenna and an equipment room, fitted with IOT equipment and infrastructure to assist clients to successfully commission new satellites. SANSA has a number of space programmes that aim to benefit SA, including the provision of satellite data, products and services to government departments to monitor a variety of aspects such as growth of informal settlements, natural resources like water, and providing real-time data for management of disaster and recovery. In order to download data, track and support these satellites over SA, the agency has a state-of-the-art facility at Hartebeesthoek that supports numerous international space launches, and provides IOT and telemetry, tracking and command for global clients. According to Hodges, SA is in an ideal position to assist satellite operators in the qualification and commissioning of their new satellites, as the country has a relatively radio-quiet environment and a good geographic position. "We have seen a steady growth in the market for IOT services, and with the existing KU-DBS facility carrying a high workload for normal transfer orbit operations, it made sense to develop a dedicated facility," he says. Data downloaded at facilities such as the one at Hartebeesthoek is compiled annually to create a national mosaic, which is in essence a combination of images taken by the Spot 5 satellite to create a map of the entire country. This map is used mostly by government departments to address various issues facing SA. 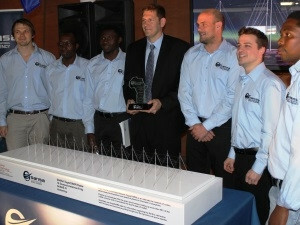 SANSA Engineers involved in the SuperDARN project with a model of the Radar located in Antarctica. The Spot 5 mosaic was recently launched and SANSA has already secured agreements with supplier of Spot imagery, Astrium, to acquire Spot 6 and 7 data, which will offer higher-resolution images. SANSA Earth Observation MD Dr Jane Olwoch explains the mosaic is made up of 485 images taken by the Spot 5 satellite, which provides information of an area 60km by 60km within each tile. The national mosaic was first incepted in 2006 and this year's national mosaic has seen a number of improvements, including an enhanced method for colour balancing, an improved true colour algorithm, and no gaps in coverage. Another improvement is the inclusion of Web map applications in the packaging, which allow users connected to the Internet to explore the image footprints and preview the Spot 5 products for each of these footprints. Acquiring the data for one map costs R17 million, excluding staff salaries and the storing and processing of data. "It is definitely a costly exercise, but the value you get out of it is much more than the money you put in," says Olwach. Olwach explains that the data provided by the national mosaic is used for a variety of purposes, such as comparing the annual maps to measure the growth of informal settlements, industrial development and the country's urban footprint. "The Department of Agriculture, Forestry and Fisheries uses the map to look at pollution in the water, particularly in Hartbeespoort Dam," says Olwach. The department also uses the map to measure climate change, as well as the viability of land for agriculture. "They also use it to estimate crop produce. For example, they have seen this year there is going to be a reduction in maize, which means an increase in the price," says Olwach. The map has even been used by police to monitor the country's borders. Although the map is primarily used by government, it is made available to all public entities, including schools, universities and research institutions. Users are able to access the SANSA Earth observation catalogue, which contains Spot 5 and other satellite imagery from the data archive. SANSA delivers a vital contribution to education in the country. In addition to making Spot 5 data available to educational institutions, the agency also launched the pilot of its Fundisa School Resources discs to all the Dinaledi schools in the country last month. Fundisa Resources is a data disc with data sets and tools specific to SA that is produced by SANSA, in collaboration with DST, annually. These discs are delivered to up to 16 tertiary institutions and enable lecturers and students to use the data either for teaching purposes or in their research. According to Maharaj, the agency this year simplified the data and tools on the disc so it can be used by Grade 10 to 12 learners in their school work and projects. "These resources will help raise awareness about the value satellite imagery adds to Geographic Information Systems analysis, and allow learners to have these skills already when they leave school. "By the time the learners graduate in Grade 12, they will have a greater understanding of Earth observation and can proceed to more focused studies at tertiary level." While the Fundisa Resources disc usually contains data from three or four satellites for the whole of SA, the school education discs have each been individualised to contain scenes relating to the schools' areas of interest and surrounding communities, explains Maharaj. The satellite images can be used to observe a variety of aspects. In addition to the data discs, SANSA has launched a Fundisa portal, where learners from all high schools in the country can access the latest satellite data, as well as a number of years' archived data, and engage with SANSA experts. The focus for SANSA is to bring the benefit of space science and technology investment back to South Africans through various space programmes, from Earth observation and space science research, to providing space operations support and exploring the space engineering competencies through development of our next satellite, says Maharaj. Last week, SANSA announced it will take part in India's first Mars operation, by providing satellite tracking, telemetry and command services. DST CD Space science and technology Mr Humbulani Mudau; Natalie Diemer, SANSA data, products and services manager; Dr Sandile Malinga, SANSA CEO; Hugo de Lemos, SANSA remote sensing specialist. The Indian Space Research Organisation (ISRO) successfully launched its PSLV-C25 rocket carrying the Mars Orbiter Mission (MOM) spacecraft in November. Less than two hours after the launch, SANSA's Hartebeesthoek ground station acquired the satellite signal and is providing the craft with transfer-orbit support services (TOSS). Pandey Shyam, an ISRO scientist stationed at Hartebeesthoek for the TOSS duration, explains that the ground station is the closest point to the satellite per pass. "The satellite is in its elliptical orbit, and several manoeuvres are planned before the final Mars injection manoeuvre, which should take place around 30 November," says Shyam. MOM will orbit the Earth for 20 to 25 days, before embarking on a nine-month expedition to Mars. This is India's first deep space mission and is aimed at establishing the country's technological capabilities. It will look for signs of life on the red planet and study its surroundings. The Mars Orbiter has five unique instruments on board: a Lyman Alpha photometer, a Mars exospheric neutral composition analyser, a Mars colour camera, a thermal infrared imaging spectrometer, and a methane sensor for Mars. Shyam explains what makes the mission different to others is the methane sensor, because if methane is detected, it could be an indication of life. If the orbiter reaches Mars successfully, India will become the first Asian country to have a spacecraft orbiting the red planet and the sixth agency to launch a spacecraft heading for Mars.